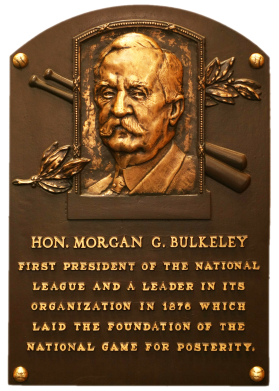 Morgan Bulkeley's notoriety is in his almost complete anonymity. In 1876, he was named the first President of the new National League, because of his respectable standing in the business world. He served one year without distinction and resigned. 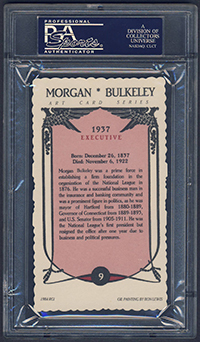 Comments: I'm not aware of a contemporary portrait card of Bulkeley so I went with the Callahan issue. In August, 2004 I won a PSA 8 example on eBay. A few months later I upgraded to this MINT example with another eBay win on 11/25/2004. 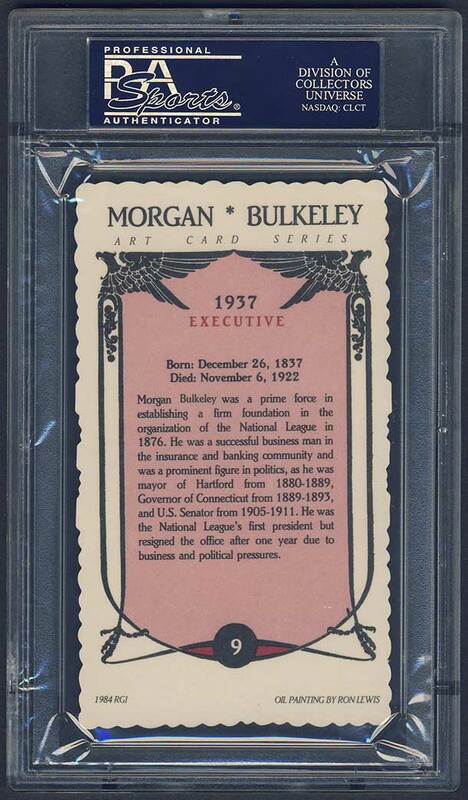 UPDATE: I missed out on an opportunity to purchase a GEM MT graded example of this card and regretted it. The shot of Bulkeley was so much better than the image on the Callahan. 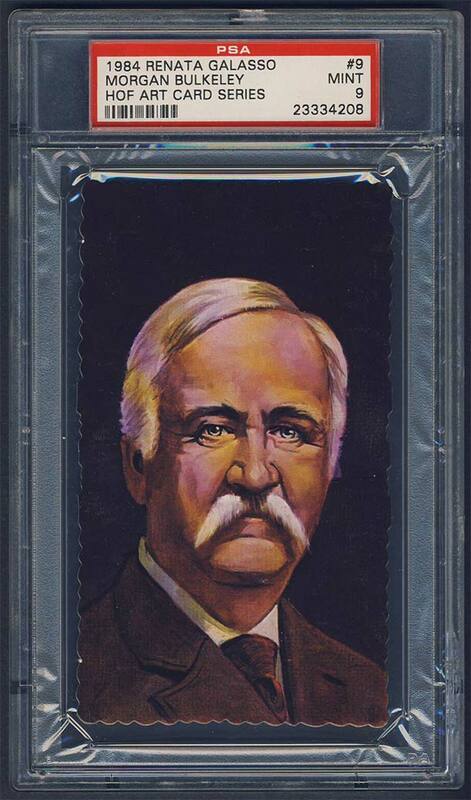 Well, in Feb 2014 this mint example popped up on eBay and I won the auction. I didn't have the issue represented in the collection and had several other HOFers represented by the Callahan set, why not? UPDATE: On March 11, 2014 I ended up winning two separate auctions for raw Bulkeley Deckle cards from different sellers. Hopefully, one of these is a GEM. UPDATE: The cards were sent off to PSA, along with 136 other sportscards, with hopes of scoring an upgrade. After three months of waiting the cards were returned to me on December 10th. I didn't open the box all at once to reveal the grades but had my kids randomly pick four cards to share with me on a daily basis to keep the excitement going. This is the best part of getting cards graded...what's it going to be? On Day 2, my son handed me both cards - PSA 9s. The wait for a GEM continues. Click here for the full results of the submission.